Below are the films that will run on Saturday. Remember, these screenings are not open to members of the public; you have to be a convention attendee. There’s no separate admission charge. 10:00 — Drums of Fu Manchu, Part Two. The action moves to Asia as Fu Manchu races to beat Nayland Smith and his friends to the lost tomb of Genghis Khan. The second half of Republic’s 1940 serial sacrifices some of the first half’s spooky atmosphere but boasts a faster pace and outstanding action sequences, including some lifted from the studio’s 1938 feature film Storm Over Bengal. For the record, our specially prepared cut eliminates repetitive situations from the serial’s last third, which most fans agree was unnecessarily padded. 12:00 — Yours Truly, Jack the Ripper (1961). Few Weird Tales stories have been anthologized more than this Robert Bloch classic, first published in the Unique Magazine’s July 1943 issue. Thriller’s second-season adaptation boasts impeccable credentials: It was scripted by prestigious feature-film screenwriter Barré Lyndon, directed by well-regarded actor Ray Milland, and acted by an outstanding ensemble cast headed by John Williams and Donald Woods (with Boris Karloff on hand as host, of course). The story unfolds in New York, some 70 years after the original Ripper murders. A newly arrived British nobleman believes that Jack is still alive—eternally young as a result of some deal with the devil—and once again practicing his grisly craft in the Big Apple’s sleaziest streets. 01:00 — Masquerade (1961). Henry Kuttner’s blackly humorous short story from the May 1942 number of Weird Tales was the source for one of Thriller’s most memorable episodes. Years, in fact decades later, fans of the series could recall the twist ending even if they couldn’t remember the story’s title or plot details. Tom Poston and Elizabeth Montgomery play a young couple, lost while on their second honeymoon and presumably at the mercy of a family of cannibals running the ramshackle Southern hotel in which they’ve sought shelter. The couple, initially inclined to laugh off their spooky surroundings, accidentally uncover a shocking secret. 02:00 — The Face of Fu Manchu (1965). The first of five Fu Manchu movies produced by Harry Alan Towers and starring Christopher Lee as the Devil Doctor. Towers, who scripted the film under his nom de plume of Peter Welbeck, didn’t adapt a particular Rohmer novel but incorporated bits and pieces from several. 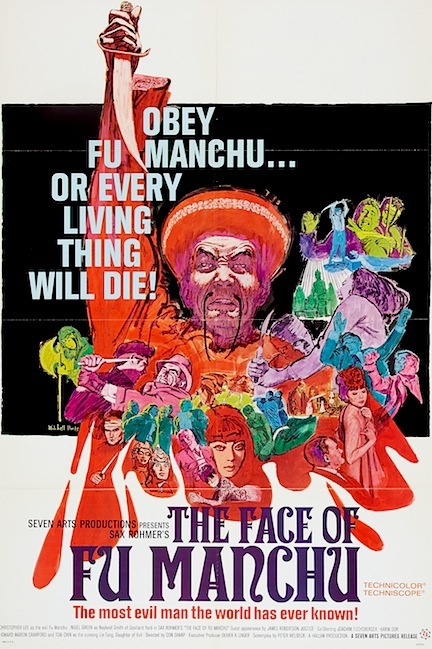 Face of Fu Manchu takes place largely in London but was shot mostly in Dublin. As its melodramatic thrills were very much of a piece as those found in Edgar Wallace novels, Towers cleverly cast German actors Joachim Fuchsberger and Karin Dor in key supporting roles; having co-starred in several of their country’s wildly popular Wallace adaptations, they lent considerable box-office allure to Towers’ modestly budgeted film, especially throughout Europe. Although the production values are skimpy—with period detail particularly sloppy and inaccurate—Face teems with action, suspense, and atmosphere. It’s by far the best of the Towers-produced quintet starring Lee as Fu Manchu. 03:45 — The Whisperer in Darkness (2011). Several years ago we ran The Call of Cthulhu, a privately produced, wholly faithful adaptation of H. P. Lovecraft’s epochal Weird Tales story. Windy City attendees who praised that film will be delighted to see this sequel, also made under the auspices of The H. P. Lovecraft Historical Society. Whisperer actually expands on Lovecraft’s original (first published in the August 1931 Weird Tales) while tale while still maintaining fidelity to it. Miskatonic University professor Albert Wilmarth tries to uncover evidence of strange creatures rumored to dwell in a mountainous region of Vermont. The investigation leads him to unimaginable horrors threaten his sanity as well as his life. Very stylish—and stylized—adaptation of a key Lovecraft tale. Immediately Following Auction — Pickman’s Model (1971). Lovecraft’s terrifying short story, first published in the October 1927 issue of Weird Tales, has been adapted by filmmakers five times to date, most recently last year. This version, which originally aired in 1971 as an episode of Night Gallery, was not only the first version but also the first Lovecraft yarn made for TV. Bradford Dillman, no stranger to troubled young men, plays eccentric art teacher Richard Upton Pickman, whose private studio becomes the scene of unremitting horror when a curious student follows him home. Not as faithful to the original story as subsequent adaptations, this version of Pickman’s Model is not without merit and will make a satisfying cap to our weekend-long salute to Weird Tales on the small screen.